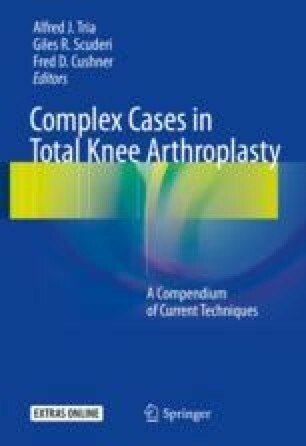 Wound complications following total knee arthroplasty (TKA) can be a serious and challenging problem. As the number of TKAs increases annually, the number of complications is expected to rise. Impaired wound healing or soft tissue compromise can lead to more devastating complications, such as extensor mechanism disruption and infections. An organized approach to wound complications includes identification of the lesion, classifying the severity and depth of the defect, and initiating appropriate treatment . Optimal treatment requires a comprehensive interdisciplinary approach with collaboration between orthopedic surgery and plastic surgery. Critical for a successful outcome and implant retention is timely reaction to the appearance of a wound problem and restoration of complete soft tissue coverage .